Australia is really kicking it up a notch with their music exports lately and The Faim are ready to take the world by storm. After working with massive names like Josh Dun of Twenty One Pilots, Mark Hoppus of Blink-182, snagging co-writes with Ashton Irwin of 5SOS (“Summer Is A Curse”) and Pete Wentz of Fall Out Boy (“Saints Of The Sinners”), The Faim tapped legendary producer John Feldmann for their debut “Summer Is A Curse EP” due out September 7th. The Faim aren’t letting anything stand in their way and have already racked up an impressive 3.5 million global streams on Spotify on their last single, “Summer Is A Curse.” The band just unveiled their newest pop friendly single called “A Million Stars” and displays frontman Josh Raven’s powerhouse vocals. Listen to “A Million Stars” below on Spotify! The “Summer Is As Curse EP” will serve as a prelude to The Faim’s hotly anticipated debut album expected in 2019 and will include five brand new tracks that show off their stadium ready sound, impressive songwriting chops, as well as their pop-punk energy and infectious hooks. The Faim are currently on tour in Europe through October. Check out the tour dates below and grab your tickets now! Be sure to grab a copy of the smash single “Summer Is A Curse” on iTunes and Amazon and don’t forget to pre-save the brand new EP on Spotify so you can be among the first to have all 6 tracks instantly! Follow The Faim and Secret Fangirls on Twitter for the latest on your new favorite artists. They’re back with a madness! Fall Out Boy are proving why they’re still the kings of pop punk even if you don’t think they’re pop punk anymore. Pete, Andy, Joe, and Patrick just dropped their long awaited new album “MA N I A” and announced a massive tour for Fall 2018. Get ready to sing until your lungs give out because they’re bringing Machine Gun Kelly with them and so many more friends! Every Chicagoan dreams of playing Wrigley Field and FOB are going home for the show of a lifetime. With MGK and Rise Against, they’re playing the iconic stadium on Sept. 8th for one special night only. Wrigley Field will include an Angels And Kings resurrection, an exclusive merch pop up store with new designs, old ones you thought you would never see again, and many more surprises! Tickets for “The MA N I A ” Tour go on sale Friday January 23rd at 10am local venue time. Merch order presale codes are available through the FOB webstore and are available with any purchase of any merchandise item. Want another chance for presale tickets? Sign up for the Fall Out Boy mailing list and get another crack at tickets before the public on sale. Check out all of the dates below and we’ll see you there! Watch the brand new video for “Church” below. Grab a copy of “MA N. I. A” on iTunes or Amazon now so you can sing along on tour! Be sure to follow Fall Out Boy, Machine Gun Kelly, and Secret Fangirls on Twitter. FOB are the kings of teasing their fans and since they released a bizarre trailer in some Chicago movie theaters, fans went into a frenzy trying to decode it. Pete, Patrick, Joe, and Andy dropped a brand new single, album pre orders, and Fall tour dates in one fell swoop which is overwhelming for some but has us super excited! The brand new album, “M A N I A ” is due out September 15th with pre-orders available now as well as exclusive bundles that include new merch like backpacks, enamel pins, hoodies, and socks! The tour starts in October and brings FOB through Brooklyn and across the US through November. Check out all of the tour dates below and get your tickets when they go on sale Monday May 1st at 10am local time. Watch the official video for “Young And Menace” below! Pre order your copy of “M A N I A” on iTunes or Amazon! Be sure to follow Fall Out Boy and Secret Fangirls on Twitter. The brand new music video for Fall Out Boy and Demi Lovato’s collaboration on the new single “Irresistible” is everything we ever wanted – Demi Lovato on a Fall Out Boy song in a music video that’s an homage to our favorite *NSYNC video! Patrick, Joe, Andy, and Pete are turned into dolls that nobody wants, just like *NSYNC was overlooked in the original video. The description for the video says it’s “about the toys that nobody wants that come to life” and form a band of misfits together. Even better: Wayne Isham, the same director who did the original *NSYNC “It’s Gonna Be Me” video reprises the doll video, and he even brought Chris Kirkpatrick and Joey Fatone back for the FOB + Demi collab. Watch the video below for some serious boyband nostalgia! 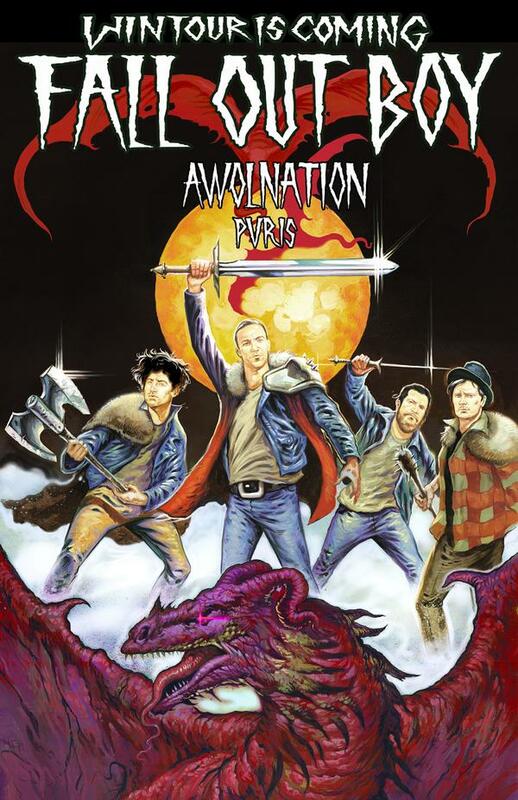 Fall Out Boy are hitting the road this Spring on the “WinTour Is Coming” Tour featuring AWOLNATION and PVRIS. Check out the dates and get your tickets HERE. Pick up a copy of “American Beauty/American Psycho” on iTunes or Amazon now. Be sure to follow Fall Out Boy, Demi Lovato, *NSYNC, and Secret Fangirls on Twitter. It’s the freaking weekend and we’re about to have us some fun! Here’s what we’ve been listening to this week. Fall Out Boy just announced a brand new tour called “WinTour Is Coming” in February 2016! The massive arena tour will feature AWOLNATION and new rockers PVRIS! All three bands will be hitting arenas around the United States in March for a final celebration of the “American Beauty/American Psycho” album. Check out the tour poster and dates below! Tickets go on sale this Friday, October 16th. Be sure to follow Fall Out Boy, AWOLNATION, PVRIS, & Secret Fangirls on Twitter. iHeartRadio is ready to make their annual Jingle Ball concert a full tour this year! Jingle Ball concerts are notorious for having some of the biggest names in music, and some of the most fun holiday themed sets to get you in the Christmas spirit! Check out the line ups for each city below!